U.S. Secretary of State Mike Pompeo is calling on Venezuelan security forces to “do the right thing” by allowing humanitarian assistance into the country. In a statement Saturday night, Pompeo also said the security forces could protect civilians against what he called the “armed gangs” of President Nicolas Maduro and support the Venezuelan constitution and the rule of law. Pompeo said, “Now is the time to act in support of democracy, and respond to the needs of the desperate Venezuelan people.” He also repeated a warning from the U.S. government that those who oppose the peaceful restoration of democracy will be held accountable. Pompeo’s remarks came after Venezuelan security forces fired tear gas on protesters trying to deliver humanitarian aid from Colombia and Brazil. Two died and 300 were injured. Venezuelan opposition leader Juan Guaido says he will ask the international community to keep “all options open” in the fight to oust President Nicolas Maduro from power. Guaido’s call came after a turbulent day in which a U.S.-backed campaign to send humanitarian aid into Venezuela met strong resistance from security forces who fired tear gas on protesters, leaving two people dead and some 300 injured. Guaido, who declared himself interim president, is recognized as so by the U.S. and some 50 nations. Venezuelan opposition leader Juan Guaido said he will meet U.S. Vice President Mike Pence at a meeting Monday of regional diplomats. The emergency meeting of foreign ministers from the so-called Lima Group of mostly conservative Latin American nations was organized to discuss Venezuela’s crisis. It will take place in Colombia’s capital of Bogota. 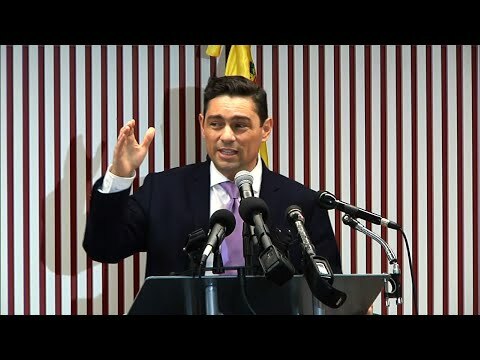 Guaido, who the U.S. and some 50 nations recognize as Venezuela’s rightful leader, spoke from Colombian city of Cucuta alongside President Ivan Duque after a day of deadly clashes with security forces blocking the entry of humanitarian aid amassed on three of Venezuela’s borders. While insisting he wouldn’t give up in his fight to deliver the aid, he didn’t ask supporters to continue risking their lives and make another attempt to break the barricades set up by President Nicolas Maduro’s socialist government. But he did make one more appeal to troops to join the opposition’s fight for power. “How many of you national guardsmen have a sick mother? How many have kids in school without food,” he said, standing alongside a warehouse where some 200 tons of mostly U.S.-supplied boxes of food and medicine has been stockpiled. Tensions are running high in the city of Santa Elena on the Brazil-Venezuela border. Thousands remained at the Venezuelan city’s international border crossing with Brazil to demand the entry of food and medicine as dusk fell. Two trucks carrying humanitarian aid are stuck at the crossing, which has been blocked by the Venezuelan National Guard. Many Venezuelans on Saturday sang their country’s national anthem and demanded that President Nicolas Maduro let the aid through. Pastor Djalma Justino Alves, 52, said he had never seen such a desperate situation. “It’s very tense, we’re living a human catastrophe,” he said. Democratic presidential candidate and California Sen. Kamala Harris says she doesn’t “condone military action at this point” to ensure humanitarian aid reaches Venezuela. Venezuela’s President Nicolas Maduro has blocked such aid at the border and resisted calls to step aside and let opposition leader Juan Guaido take power. President Donald Trump has advocated “a peaceful transition of power” but also said all options are on the table. Two other Democratic senators in the 2020 White House race, Bernie Sanders of Vermont and Kirsten Gillibrand of New York, also have said they oppose U.S. military force in Venezuela. Sen. Harris spoke before Maduro announced he was breaking off diplomatic ties with neighboring Colombia. Venezuelans are rushing to rescue boxes of emergency food and medicine from burning trucks stalled on a bridge to Colombia. A large black cloud hung over the Francisco de Paula Santander bridge as protesters passed the boxes by hand and removed them from the blazing vehicles. Fernando Flores, an eyewitness who described himself as a lawmaker from Ecuador, said national guardsmen acting under orders from Nicolas Maduro had torched the trucks once they crossed into Venezuelan territory. Maduro has vowed to block any aid shipments, considering them a “Trojan horse” intended to pave the way for foreign military intervention. Guaido made public appearances throughout the day alongside Colombia’s President Ivan Duque, an outspoken critic of Maduro and close U.S. ally. Maduro asked for the blessing of a mass of loyal supporters in Caracas. He then ordered Colombia’s diplomats out of the country within the next 24 hours. President Nicolas Maduro says he’ll never surrender and has vowed to defend Venezuela’s independence with his life if necessary. A defiant Maduro spoke Saturday in Caracas before thousands of cheering supporters dressed in red shirts, the color of Venezuela’s socialist party. He took the stage dancing with his wife. A month ago, opposition lawmaker Juan Guaido declared presidential powers and promised to overthrow Maduro, holding new elections to restore democracy. However, Maduro says he fears nothing. He called Guaido a puppet of the White House and mocked the leader, asking why he hadn’t yet called an election if he truly holds power. Five Venezuelan members of the armed forces who deserted their posts Saturday have recognized Juan Guaido as their commander in chief. In a video Guaido published on Twitter, the men in army green fatigues can be seen rising in attention and offering a military salute to the opposition leader, calling him Venezuela’s “constitutional president” and stating that they are ready to obey his orders. He also reaffirmed his offer of amnesty to all military personnel who “protect the Venezuelan people” and align with the opposition in its bid to force President Nicolas Maduro from power. Two trucks carrying humanitarian aid from Brazil are stuck at the Venezuela border, contradicting earlier reports by opposition leaders that they had managed to break through a police blockade and enter the country. An Associated Press journalist at the border said the trucks remain stationed in the arid expanse separating the Brazilian city of Pacaraima from the Venezuela city of Santa Elena de Uairen. Earlier Juan Guaido on Twitter celebrated the arrival of what he said was the first truck of humanitarian aid, echoing comments from opposition lawmakers in Caracas who are monitoring the relief effort. An army major says he’s rejecting President Nicolas Maduro and throwing his loyalty behind the opposition’s effort to bring aid into Venezuela. Maj. Hugo Parra Martinez was the fifth member of the armed forces to abandon Maduro’s socialist government on Saturday. A lieutenant and three sergeants of the National Guard surrendered earlier to officials in Colombia with raised hands. Opposition leader Juan Guaido says the military is key to restoring democracy in Venezuela, although masses of soldiers appear to remain loyal to Maduro. Images of Parra Martinez on social media and local broadcasters show him speaking through a megaphone that he’s ready to join the struggle for Venezuela’s freedom. Thousands are flooding the streets of Venezuela’s capital in rival demonstrations as opposition leaders vow to move shipments of humanitarian aid into the country despite objections from President Nicolas Maduro. In Caracas, Maduro loyalists marched by the thousands to the city center to the sounds of brass bands, while others rode motorcycles. Opposition supporters are converging on a Caracas military base, urging soldiers to join their fight. Many were dressed in the colors of Venezuela’s flag and some came in costume as Capt. America characters. Opposition leader Juan Guaido said emergency food and medicine would be delivered to Venezuela from three neighboring countries. Maduro has closed Venezuela’s borders and calls the aid part of a U.S.-led coup. The opposition gathering in the capital was much smaller than that held by government supporters, but many Venezuelans who want Maduro to step down turned out en masse near the country’s border crossings. Opposition leader Juan Guaido says the first shipment of humanitarian aid has crossed into Venezuela from Brazil. The AP could not independently confirm the aid had passed through. Guaido one month ago declared presidential powers, vowing to end what he calls the tyranny of President Nicolas Maduro. A defiant Maduro denies a humanitarian crisis exists and has ordered the closing of Venezuela’s borders to block Guaido’s effort, which he says is part of a U.S.-led coup. Opposition leader Juan Guaido has sent off a humanitarian aid convoy of trucks from Colombia toward the border of Venezuela at a pivotal moment in a showdown with President Nicolas Maduro. Guaido on Saturday spoke from the border town of Cucuta, Colombia where U.S. aid has been stored. Guaido says that he’s standing among tons of supplies, but Maduro’s government favors blocking it from entering peacefully into Venezuela, where it could save lives. Maduro has closed the country’s borders and National Guard soldiers have clashed with protesters. Protesters along Venezuela’s border with Colombia have stolen a red city bus and set it on fire to express outrage over thwarted humanitarian aid deliveries. Flames from the bus blaze in the border town of Urena also caused nearby power lines to spark. Protests broke out early in the day as opposition leader Juan Guaido vowed to move in emergency food and medicine from the United States over objections from President Nicolas Maduro. But Guaido and other opposition leaders showed no immediate signs of being able to get the aid from a warehouse in Cucuta, Colombia to Venezuela. The first truck with humanitarian aid from the Brazilian government has arrived in the city of Pacaraima on the border with Venezuela. The crossing has been closed on orders from Venezuelan President Nicolas Maduro and the truck loaded with food and medicine will now wait in Brazilian territory. Brazil’s Foreign Minister Ernesto Araujo said he expects Maduro’s government to allow the aid to pass. “It is very exciting to see people anxious to recover their freedom and have a decent life,” Araujo said. Amid flaring tensions on the border, three members of Venezuela’s National Guard have deserted their posts and solicited help from Colombia. Colombian migration authorities said they received the request early Saturday at the Simon Bolivar bridge connecting the two countries. There was no immediate word on the guardsmen’s rank. But a video provided by Colombian authorities show the men wading through a crowd with their assault rifles and pistols held above their heads in a sign of surrender. The young soldiers were then ordered to lay face down on the ground as migration officials urge onlookers to keep a safe distance. Venezuela’s National Guard has fired tear gas on residents clearing a barricaded border bridge between Venezuela and Colombia to let humanitarian aid pass through. The tensions flared at dawn Saturday at the blocked entrance of the Francisco de Paula Santander bridge on the Venezuelan border town of Urena. Hundreds of Venezuelans have camped out overnight near a bridge in Colombia where humanitarian aid that the opposition will try to deliver inside the country is being stored. Oriana Gutierrez says she traveled 14 hours to attend Friday’s concert organized by billionaire Richard Branson and wanted to stay through the following day to help bring in aid. Early Saturday some Venezuelans were singing their national anthem while others held hands in a prayer circle and asked God to protect their country. President Nicolas Maduro has refused to accept the food and medical supplies donated largely by the United States, saying it’s part of a larger plot to unseat him from power. The opposition is planning to push in the aid using trucks and masses of people along border bridges connecting Colombia to Venezuela. Once the trucks reach the border they’ll face a crucial test: Whether the military standing guard on the other side will let them through. Before daybreak Saturday, many national guards in riot gear forced people to move away from the road to the Simon Bolivar bridge connecting Venezuela and Colombia. The Venezuelan government had said that it was closing three of its bridges on the border.